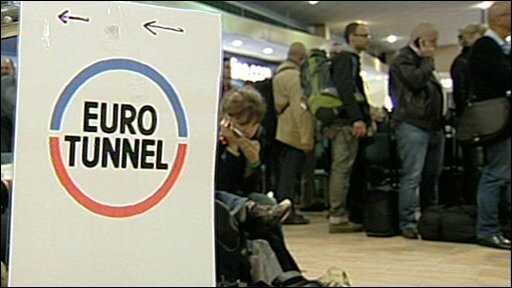 Thousands of passengers hoping to travel through the Channel Tunnel face further disruption after a fire. Both the tunnel operator Eurotunnel and Eurostar have said passengers with travel plans for Friday night and the weekend should find alternative routes. The tunnel was closed after fire broke out on a freight train about seven miles from Calais on Thursday. Thirty-two people on board were led to safety. Fourteen had suffered minor injuries, including smoke inhalation. The 16-hour blaze was put out on Friday morning. Passengers were still arriving at St Pancras International in London on Friday hoping services to the Continent would resume. But later on Friday Eurotunnel said services remained suspended for Saturday and Sunday. The operator said passengers due to make return journeys on Saturday or Sunday were advised to arrive at the Port of Calais or Port of Dover where their return travel would be honoured by other cross-channel operators. The firm said while it wanted rail services to resume as quickly as possible it could happen only once approval had been given by the authorities at the French end. Rail company Eurostar said about 30,000 passengers had been due to travel on 50 services on Friday, and would be offered a full refund or exchange. Speaking from St Pancras International finance manager Kirsty McIntyre said she had planned to spend the weekend in the Champagne region. She said they checked Eurostar's website on Thursday evening: "It just said delays are expected but it didn't say anything about cancelled services, so we came today and it's not happening. We are going to see if we can get a bus to Dover and a ferry to Calais." Others who had planned to take the Eurostar on Thursday and were unable to get hotel accommodation were forced to sleep in the station. The tunnel carries Eurostar express trains between London, Paris and Brussels, as well as freight and passenger shuttles between Folkestone and Calais. The source of the blaze has not yet been identified but French officials say a lorry carrying chemicals, which is understood to have overturned on the freight train, was close to the seat of the fire. It was carrying the chemical phenol, a toxic product used by the pharmaceutical industry. Eurotunnel chairman Jacque Gounon - who earlier said they hoped to return to half capacity during Friday - said the north tunnel, where the fire took place, would be closed for several weeks. The BBC's Europe editor, Mark Mardell, said Mr Gounon would not speculate on the cause of the fire, saying only that nothing had been ruled out or in. He added an investigation could only begin once the affected area had cooled down enough to enable the removal of the train. France's transport minister Dominique Bussereau told French radio station Europe-1 the cause appeared to be "something accidental". The blaze broke out yesterday just before 1500 BST on a train carrying lorries from Folkestone to Calais. Thirty-two people, including seven Britons, were evacuated to the service tunnel and a train ferried them to France. More than 300 French and British firefighters tackled the blaze overnight and some 27 vehicles were affected. Chief Fire Officer Bill Feeley, of Kent Fire and Rescue Service, said a large crew had been needed because of the difficult and tiring conditions and would remain in place until the emergency services were satisfied the fire was completely extinguished. A French police spokesman said the main seat of the fire was extinguished at 0700 BST after burning for more than 16 hours. Firefighters then spent two hours smothering minor fires nearby, he said. Kent Fire and Rescue Service has now said they were "scaling down" their efforts. Two fire engines were still at the scene with 12 firefighters and specialist crews, a spokeswoman said. "The bi-national status of the operation was lifted at midday so it is now a French incident," she said. "Eurotunnel has retaken control of the infrastructure and its technicians have started to carry out a physical inspection so operations can resume in the south tunnel." 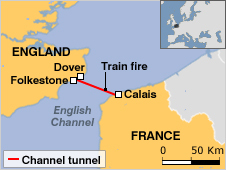 John Keefe, a Eurotunnel spokesman, said much of the tunnel was unaffected by the blaze. "Two thirds of the tunnel are still open," he said. "So we believe we should be able to get services back into operation very quickly." The closure has caused huge tailbacks on roads near the Eurotunnel terminal at Folkestone as dozens of lorries have been forced to park on the M20 and other surrounding roads. Kent Police say sections of the motorway - between junctions eight and nine - are still being used to queue lorries as part of Operation Stack and are advising motorists to avoid the area. 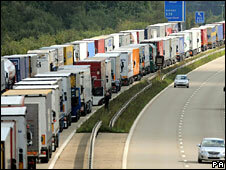 An estimated 2,000 lorries are delayed by between six to eight hours. Superintendent Peter Wedlake said: "We anticipate there will be some congestion. "People heading coastbound from Maidstone down towards Folkestone and Dover won't be able to use the M20." Eurolines, which is part of National Express, says it has increased the number of coaches on its services to Paris and Brussels to help passengers stranded on both sides of the Channel Tunnel. The Channel Tunnel has suffered several incidents since it opened to traffic in 1994 although only one - a fire in 1996 - caused injuries. 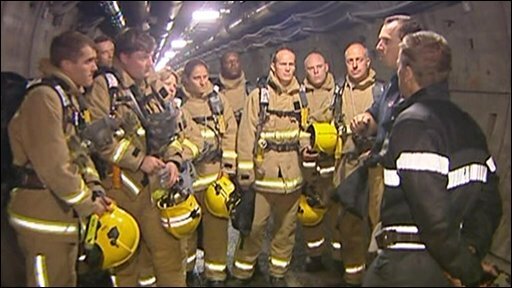 The fire caused £200m worth of damage and burned for more than five hours, wrecking the concrete lining and facilities over about half a mile of tunnel. In August 2006, 34 people had to be led to safety after a fire broke out on a lorry being carried on a freight train. Security exercises are staged in the Channel Tunnel by police, fire and ambulance services from both England and France to ensure preparedness for such incidents.